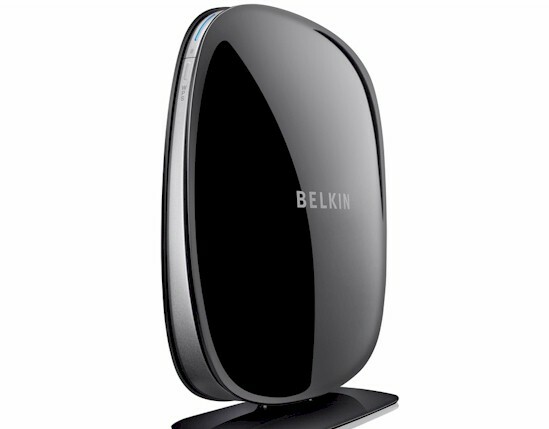 Belkin has a new N router line that has been completely revamped from head to toe. Out with its poorly-received "app" based Surf, Share, Play and Play Max line and in with five new models. The comparison chart in Figure 1 pulled from Belkin's site summarizes the key differentiators except for frequency band. There are two three-stream N models in the lineup, the 2.4 GHz single band N450 and the subject of this review, the N750 DB. As seems to be the trend with most dual-band three-stream N routers of late, the N750 DB provides up to 450 Mbps link rate on the 5 GHz radio only. And you only get that rate if you have a matching three-stream N adapter and use 40 MHz bandwidth mode. The new line retains the old one's focus on simplicity and ease of setup. As Figure 2 shows, there are only two front panel indicators, so as not to confuse non-techies. Don't go looking for network status indicators on the back panel, either. Figure 3 shows the only ones you get are for the two USB 2.0 ports that you can plug printers and drives into for sharing. Belkin ships the N750 DB with both a WAN port cable and the power supply already plugged in. They also have the usual installation CD that walks you through setup and installs a "Router Manager" app. As usual, I didn't try either one. You can't really see a lot of detail in the fuzzy FCC ID photo in Figure 4. Fortunately, the internal pictures file has closeup shots of the key components. The main CPU and 5 GHz radio come from a Ralink RT3883F 3X3 N SoC. This is a second-generation 3X3 N device from Ralink, that's also in TRENDnet's TEW-691GR and probably in the just-available TEW-692GR. The 2.4 GHz radio is a Ralink RT3092 2X2 N SoC. A Realtek RTL8367R 5+1-port Gigabit Ethernet switch handles the WAN and LAN ports and I was able to make out 64 MB of RAM. I couldn't see how much flash, but my guess is 8 MB.